Counting has begun for the all crucial five state assembly polls today with initial trends indicating Congress gaining in Rajasthan, Chhattisgarh while a tight contest is on for MP. TRS is on way to sweeping Telangana. 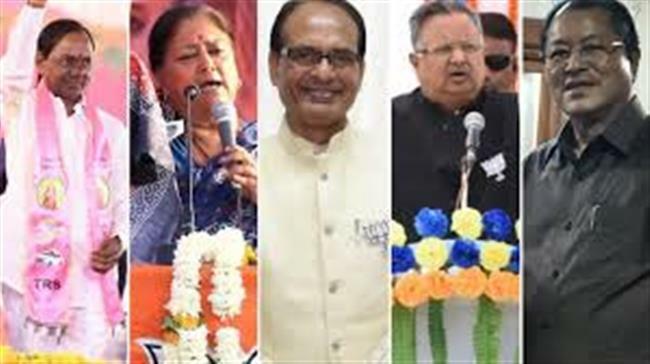 Results for the elections, billed to be the semi finals for the next year Lok Sabha polls, will be declared for Assembly elections to five key states of Madhya Pradesh, Rajasthan, Chhattisgarh, Telangana and Mizoram. Whichever way they swing, the results of the “mini-general election” will hold important clues to trends and messages from the ground for all, including on farmers’ anger and agrarian distress especially in Madhya Pradesh and Rajasthan. Rural distress is said to be a big game changer in the 2019 General Election. The BJP believes the anger has been whipped up by the Opposition for “narrow political gains” to counter the “good work done by the Modi government in the sector”. The party feels the same about allegations of anger among youth and unemployment. The results will also show whether Congress’ Rafale deal attack is sticking and BJP’s “Hindutva” appeal is holding given its active use by star saffron campaigner Yogi Adityanath. For regional players, especially fence-sitters (including small partners currently with the BJP-led NDA like the RLSP that quit the alliance today), the results will provide a clearer picture on the way forward. They will also be a barometer of independent political relevance of regional players like the Mayawati-led BSP, Samajwadi Party and AIMIM, other than being alleged “vote spoilers” or “Plan B operators”.